President Donald Trump announced new tariffs on steel and aluminium on Thursday. Republicans do not like these tariffs. GOP Sen. Jeff Flake wants to pass a bill to block them. 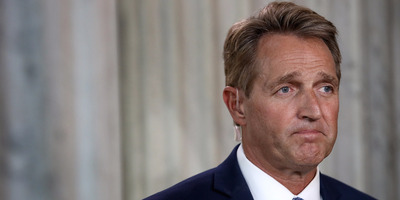 Republican Sen. Jeff Flake wasted no time responding to President Donald Trump’s new tariffs on steel and aluminium on Thursday, rolling out a bill to reverse the decision. Flake said the new tariffs, which function as taxes on imports, of 25% on steel and 10% on aluminium would be detrimental to the US economy and must be stopped. A slew of Republicans, including House Speaker Paul Ryan and Senate Majority Leader Mitch McConnell, expressed concern about the tariffs in the run up to the announcement. Trump ultimately backed down slightly from what were initially described as broad-reaching, indiscriminate tariffs, exempting Canada and Mexico as well as creating a pathway to exemption for other nations. But Flake said that was not enough and Congress must act. While Republicans came out against the trade measure, Flake is the first to announce a legislative response. Flake has been a vocal critic of the president. He is set to retire after 2018.